Akihabara is a place of wonder. For many, it’s a mecca of everything otaku-centric. Music, animation, gaming, and food. Beyond that is an entire subculture that foreigners rarely get to see outside of media (Genshiken, Comic Party, etc). XSeeD Games and Acquire have come together with one of the truer representations of that slice of Japanese life, only with a certain unmistakable twist. 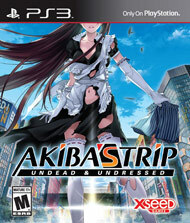 Akiba’s Trip: Undead and Undressed is the second title in the series, and the first to reach Western shores. Does Akiba’s Trip have a style all its own, or is it all just for show? 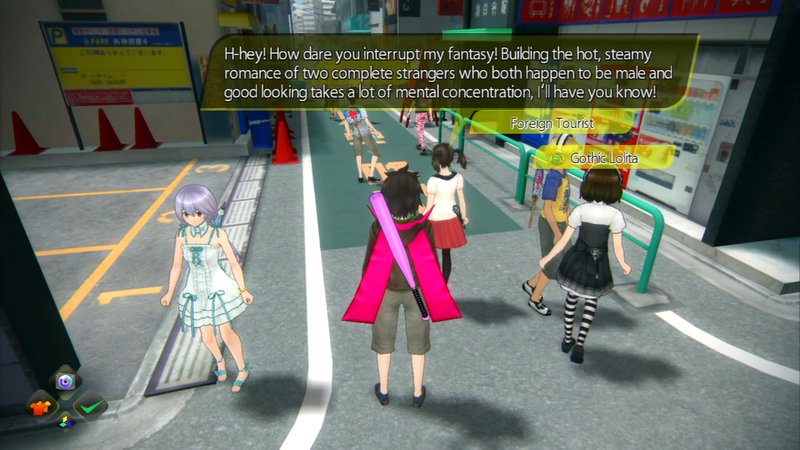 Akiba’s Trip opens with an unnamed protagnist being tested on by a radical group all for the sake of science. In exchange for material goods (in this case, the MC wants a collection of rare figurines), he allows this group to test a new drug on him. The side effects? He’s turns into some sort of man-made vampire, or Synthister as they’re commonly referred to in-game. Sunlight becomes his greatest weakness, but it only truly affects him (and other synthisters) when fully exposed down to his tighty-whities. Before long, synthisters start running amok and the MC along with a self-established group of volunteers called the Akiba Defense Force, a group fo do-gooders focused on cleaning up Akihabara and performing other various charitable acts. Who knew that stripping down vampires in broad daylight could become a public service? Within an hour of starting Akiba’s Trip, I had been turned into a vampire, learned how to strip others down (in chain combos even! ), ran into a girl shouting her love of boys love doujinshis, and ate at a local branch of GO!GO!CURRY! Part of what makes Akiba’s Trip so endearing is how true to the Akihabara mecca it presents itself. While just a small square blocks in the heart of Tokyo, Akihabara feels like its own little world. 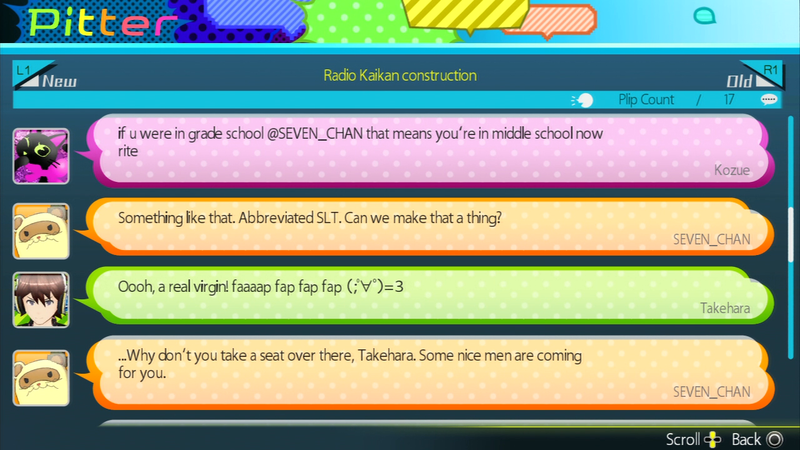 People carry on message board conversations about their daily life. Cosplayers walk around during the day, maids stand out passing handbills advertising a local maid cafe, giant billboards showcase upcoming games and anime. Since this is an Acquire-developed title, many ads for Mind-Zero litter the streets right along side those for Disgaea 4 Portable, the Genshiken anime, and Super Sonico. It’s like a small period piece for what was popular during that few weeks period. If you’ve ever played the Yakuza/Ryu ga Gotoku series, it’s easy to see how just one small section of town can be all you need to focus a game around. 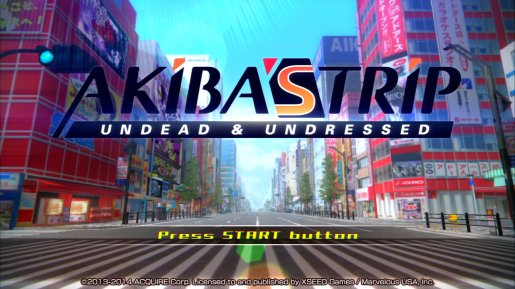 For a game focused around stripping citizens down to see if they’re vampires/synthisters, Akiba’s Trip has quite an expansive way of doing it. Random encounters happen quite frequently on the streets of Akihabara, moreso if you start shoving people around to see who retaliates. 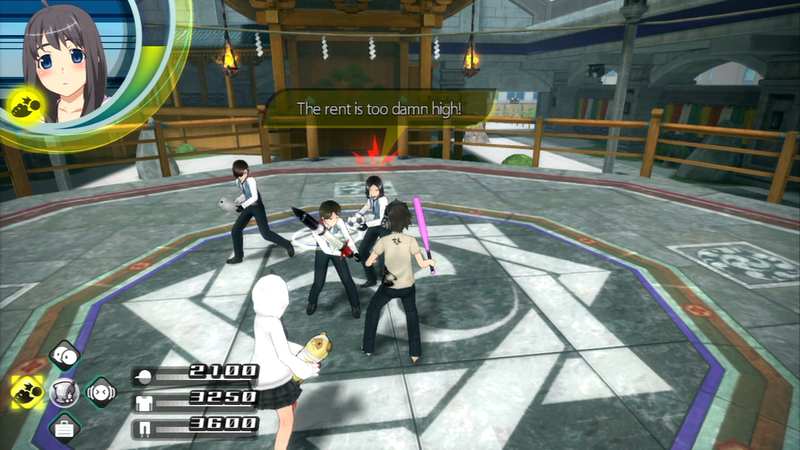 Instead of a health gauge, both players and opponents have a sort of stamina gauge on the three articles of clothing (hat, upper, and lower). Dealing enough damage to these parts will render them able to be stripped off. There’s an audio cue of something crunching along with the aforementioned article glowing a gaudy purple, but sometimes these are easy to miss in the heat of combat.